Today’s post is compliments of Education.com, which provides digital resources for educators, including homeschoolers. Try out their basic membership for free! Spring is in the air. It’s such a fabulous time of year with all the colors and new beginnings. Kids will love this printable as they search for spring words. Be sure to check out Education.com for more spelling and learning activities just like this. Education.com is the #1 educational site for Pre-K through 5th grade. Their digital resources, tools, and learning materials are developed by educational experts to incorporate leading pedagogical practices. They are useful in any type of teaching moment and many can be used to support national education standards. From school teachers and tutors to homeschoolers and parents, engaged adults are the key to unlocking each child’s potential and drive to learn. 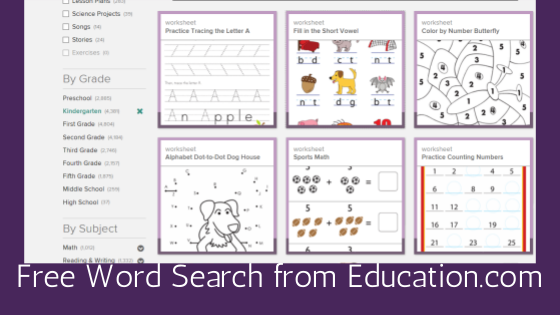 Education.com empowers all kinds of educators to teach kids by providing the best educational resources in any form or device to be used at home, at school, and everywhere in-between.